Another Hollycraft beauty, this bracelet is considered rare and makes quite a statement. 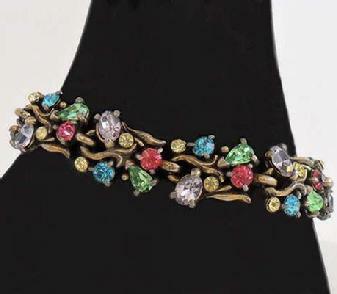 Here is a wonderful 1950 Hollycraft rhinestone bracelet. The design features pastel, faceted lavender, pink, blue, yellow and peridot rhinestones. The setting is antiqued gold-tone and is signed Hollycraft Copr. - 1950. This lovely vintage bracelet measures 7" x 1/2" and is in good condition (some missing stones). Hollycraft was designed by the Hollywood Jewelry Mfg Company. Founded in 1938 by Joseph Chorbajian, his cousin and Jack Hazard, the company was located in New York City. The Hollycraft mark first appeared in 1948 and the company stopped operation in 1971. Pieces manufactured suring the 1950's were dated. Beautiful combinations of pastel stones were their signature colors.